The Water System page includes a video discussing all the effiency measures related to the supply, use, and disposal of water. The average Auckland home uses around 150,000 litres of water a year1 and typically buys all of that from Watercare. A volumetric charge based on the amount of water used. The average house pays around $470 a year for this portion of their bill3. We have a mains water connection like any other house but we’re also using a 5,000 litre rainwater tank. Rainwater is collected from the roof via downpipes that feed into the underground tank which is then used to flush toilets, wash clothes, and water the garden. We expect the tank to meet around half our water needs over the course of a typical year, which could cut the volumetric component of our water bill in half – a saving of more than $200 a year, or $5,000 over 25 years. Our rainwater tank could save us more than $200 a year, or $5,000 over 25 years. There are benefits to Watercare too. Each day 370 million litres of water are provided to Aucklanders4, with most of that being supplied from damns, rivers, and springs on the outskirts of the city to suburban streets. Each rainwater tank reduces the volume of water that needs to be treated and supplied around that distribution network. Also, each of those 370 million litres is treated to drinking quality – but around half of the average home’s water usage is in flushing toilets, watering gardens, and washing clothes5. We’re pouring drinking water down our toilets each time we flush them. Using rainwater for these purposes means each installed tank reduces unnecessary water treatment. We've installed a CME booster pump from Grundfos. This distributes water from the rainwater tank to where it's needed in the house, with pump speed adjusted to meet demand. This variable speed technology allows the pump to use up to 60% less energy than a comparable constant speed pump, which helps us get to our Zero Energy goal. Most houses can rely on mains pressure to move water to where it is needed in the house. Using a rainwater tank requires a pump to control distribution, and this provides an opportunity to install an efficient product to reduce energy demand, helping us achieve our Zero Energy goal. To move water from the tank to the toilets, washing machine, and outside taps, we’ve installed a Grundfos CME booster pump. 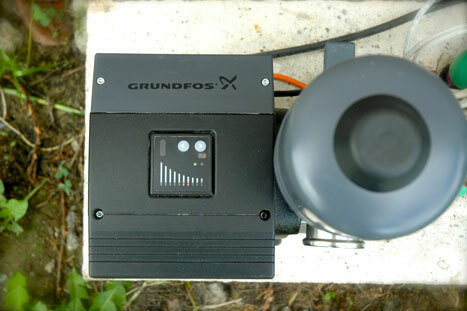 The pump has a variable speed motor and is controlled by a Grundfos Direct sensor, which determines how much water is required by measuring changing water pressure in the house. This means the pump speed adjusts to meet demand. As a toilet is flushed, the washing machine operated, or an outside tap turned on, the pump uses the minimum amount of energy required. It also has an inbuilt stop function to stop operation on low demand and then restart on demand. This allows the CME Booster to consume up to 60% less energy than a comparable constant speed pump. This operation also means a constant pressure is maintained in the pipe system, regardless of fluctuating demand. Pump detail showing variable speed display. Based on average household consumption of 150,000 litres a year (see footnote 1) at current Watercare rates (see footnote 2). BRANZ (2008), figures 2 & 3, p5.